Several years ago, Al-Qaeda made a strategic decision to refrain from foreign terrorist operations, refocusing away from these global spectaculars towards integrating more closely into local conflicts. The 2014 rampage across Iraq and Syria by Al-Qaeda’s rebellious former Iraqi branch, the Islamic State (ISIS), provided both the opportunity and additional incentive for a long-mediated rebranding effort. However, there have recently been signs of a shift back towards external terror operations, just as ISIS undergoes a setback and Al-Qaeda has a chance to reassert its dominance over the jihadi scene. Take the case of Samiun Rahman, a British citizen of Bangladeshi heritage, who is being tried in India for terrorism-related offences. Rahman’s case resurfaced thanks to The Sunday Times. Rahman, 28, grew up in a council flat near Gray’s Inn Road in Bloomsbury, central London. Rahman was, The Sunday Times says, radicalised in 2010 while in prison for non-terrorism-related offences. Upon release, Rahman became a cab-driver, the job he held up to the moment he departed for Syria in late 2013, joining Al-Qaeda’s then-declared branch in the country, Jabhat al-Nusra. At the present, Al-Nusra is known as Hay’at Tahrir al-Sham (HTS) and has ostensibly severed its command relationship with Al-Qaeda “central” (AQC). Rahman used the kunyas “Ibn Hamdan Miah” and “Ibn Hamdan al-Bengali”. He spent four months in Syria with Al-Nusra, before being able to return to Britain. When questioned, he claimed he was an aid worker. As The Sunday Times notes, Rahman was posting material on Facebook, under the “Miah” alias, that made his militancy quite clear. But authorities missed it. Around March 2014, Rahman was able to travel on his British passport to Bangladesh, where he was arrested six months later as he tried to recruit jihadists to send to Syria. Rahman was wrongly accused at the time, just after ISIS’s “caliphate” had been declared, of working for ISIS. Released from Bangladeshi prison in April 2017, Rahman was arrested in India in September 2017. This is where it gets interesting. Local media at the time reported that Rahman had been “assigned … the job of recruiting Rohingya refugees from India” and raising money by HTS/Al-Nusra leader Ahmad al-Shara (Abu Muhammad al-Jolani). Rahman confessed to entering India in July 2017, and recruiting twelve people who were to be sent over the border into Burma, where the army has been ethnically cleansing Rohingya Muslims. India maintains Rahman entered the country on orders from Al-Shara “to set up a terror cell in Delhi to carry out attacks and recruit Muslims in Kashmir and neighbouring Burma to exploit regional tensions”, according to The Sunday Times. Days before Rahman was arrested, Al-Qaeda released a statement trying to capitalise on the Burmese situation by presenting itself as the guardian of a Muslim population abandoned by the world. The implications of the charges against Rahman are potentially quite profound. 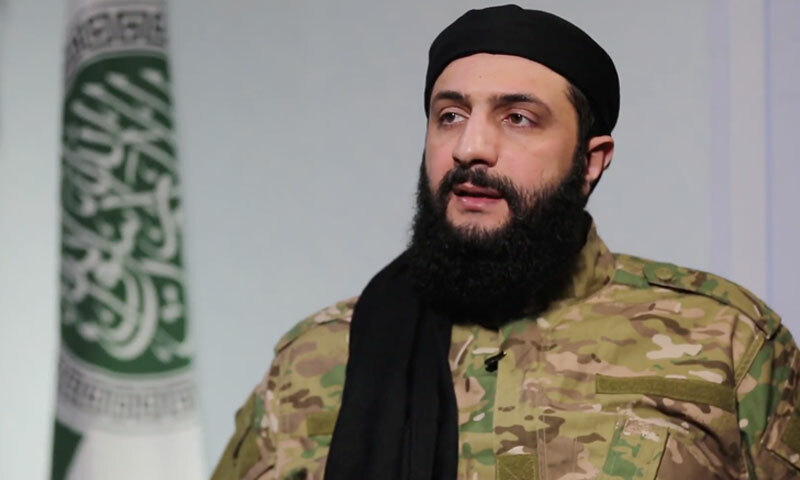 Al-Qaeda’s localist-integrationist strategy has become ever-more pronounced in the years since 2014, reaching its zenith in Syria under Al-Shara’s leadership. HTS/Al-Nusra has secured dominance over the remnants of the Syrian insurgency, albeit at the price of strategic defeat and being crammed into the north-western Idlib province, nominally policed by Turkey and surrounded on all sides. Still, having taken the localism so far as to publicly sever itself from Al-Qaeda, HTS has possibly found a viable jihadi survival strategy. But only if HTS can convince the outside world that it has abandoned the Al-Qaeda-style globalism and that its grim system of Islamist governance is no danger beyond the bounds of Idlib province. The Rahman case threatens that narrative, and it is not a totally isolated incident. The Federal Security Service (FSB) of Russia maintains that the April 2017 attack on the St Petersburg metro, the simultaneous attempted attack on the Moscow metro, and the thwarted May Day 2016 attack were guided from Syria by Al-Nusra. While official statements from the Russian security services can hardly be taken at face value, least of all about Syria, there is far more credible evidence from the United States. Abdirahman Sheik Mohamud was charged by a Grand Jury with two terrorism-related offences and one count of lying to investigators in April 2015, and convicted in January 2018. Throughout the trial, it was disclosed that Mohamud had “admitted to traveling overseas … and receiving training from terrorists”, namely Al-Nusra, and also “admitted to returning to the United States and planning to conduct an attack on American soil”. Many questions remain about how closely Al-Nusra had been guiding Mohamud, at what level his mission had been authorised, and if he was a one-off. Whatever the answers, they violate Al-Shara’s pledge in his first interview that areas under his organisation’s control would not be used “as a base to launch attacks on the West”. Perhaps it will be said that Al-Shara has evolved since these events, even if the most recent one is within the last eighteen months, and/or that he is constrained by his current interests. This would put a lot more faith than is reasonable in a man who has proven faithless. The defence of Al-Shara that rests on his break with Al-Qaeda is even more dubious. As ISIS was grabbing the headlines and keeping Western security services busy by trying to take on the world all at once, Al-Qaeda adjusted its strategy and dug in for the long game. The collapse of ISIS’s “caliphate” is hardly the end—even of the external attacks, which continue to be planned on a significant scale and to be executed from France to Afghanistan to the Philippines. But the tempo of ISIS’s global terrorism is likely to be reduced for a while as it recovers and nurtures its guerrilla war in Iraq and Syria. This provides a window for Al-Qaeda, armed with a powerful “I told you so” narrative about the inadvisability of declaring a caliphate, to try to retake the jihadi agenda. This boost to its legitimacy—the appearance of Al-Qaeda as the adult and serious jihadi branch—will surely spur recruitment. In more material terms, Al-Qaeda and its derivatives weathered the ISIS storm in crucial zones like Syria, Yemen, and much of the Maghreb, entrenching to the point that it is difficult to separate the jihadists from local dynamics—and nearly impossible to strike at them in retaliation if one of these zones is used to attack the West. Al-Qaeda has never disavowed terrorism against the West—in the wake of the attack on the New Zealand mosques last month, Al-Qaeda reiterated the legitimacy of such attacks—and should the group choose to make external operations part of this bid for jihadi hegemony, it seems likely they will be able to do so. The national uproar in Britain over Shamima Begum is at least in part because the government has handled the returnees’ issue ineffectively. Only 40 of 400 returning terrorists have been prosecuted, which shows the seriousness of the problem, as does the ease with which Rahman traversed Britain. Still, that fact also suggests Al-Qaeda and those in its orbit have not quite returned to terrorism in the West: in years past, an operative like Rahman would surely have been dispatched to Britain by the jihadists, and instead he was sent to the Subcontinent. Even a more regional focus by Al-Qaeda is a serious concern, however. At times Al-Qaeda has seemed to want to exploit the inflamed sectarian environment in the Middle East to present itself as a pragmatic ally to various Sunni governments. Al-Shara certainly harbours intentions to gain state patronage—and protection—for HTS if he can. Such a compact with the jihadists has usually proven most dangerous to the states that accept it. Since Al-Qaeda has its own agenda and appears to retain the ability to seed its operatives throughout the Middle East and Asia, to get its agents in place for if and when it decides to recommence attacks against Western interests and allies, that pattern seems likely to be repeated.